Trying to predict the future of anything—let alone public libraries—is a tricky task. 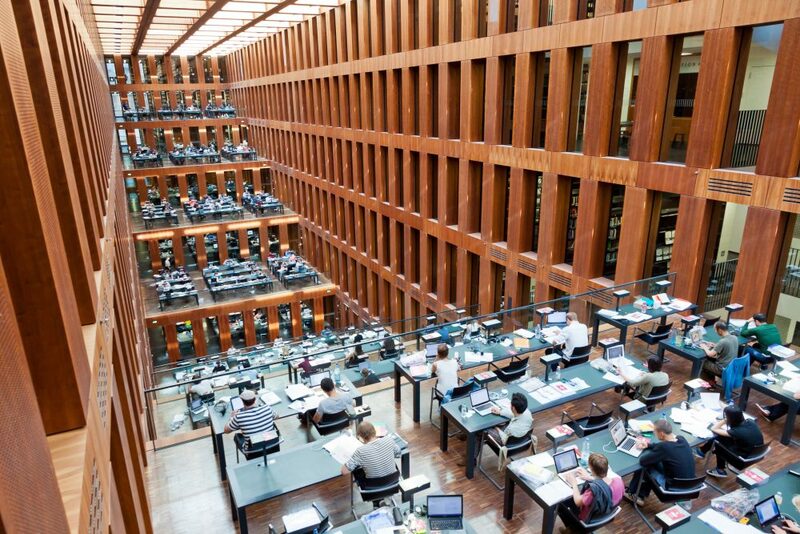 But unequivocally we can say this: Libraries are not about to become purely digital endeavors. The notion that e-books will completely replace physical books is tired. So rather than dwelling on that topic, which has become a favorite pastime of armchair futurists, let’s focus on the people affected by libraries instead of the collections contained within them. Whether individuals prefer paperbacks or reading on a mobile device is trivial compared to the fact that American society is becoming highly unequal. The trend suggests a Dickensian future—albeit one filled with smartphones. The real question is: How will the mission of public libraries evolve in a world filled with such gross inequality? The gap between the rich and poor is reaching historic highs in the United States, with the rich getting richer while wages stall or fall for lower-income Americans, threatening to hollow out the middle class. The last time the U.S. experienced this level of inequality was in the late 19th and early 20th centuries—around the same time that public libraries first started catching on because of the efforts of Gilded Age industrialist Andrew Carnegie, who donated $60 million to fund more than 1,500 across the country. Yet the library patrons of the future might be more sympathetic to the cries of Carnegie’s most vehement critics, striking steelworkers who wanted higher wages and demanded to know: “What good is a book to a man who works 12 hours a day, six days a week?” And those grueling 19th century hours might even be preferable to the impermanent shift work of the gig economy (think Uber) or to the troubling trend of jobs being eliminated altogether by technology (think driverless Uber). What happens to all those people without stable employment? Will public libraries become their government-subsidized third space? Will public libraries be to temp workers what Home Depot parking lots are to day laborers? Probably. Increasingly, people will flock to libraries to access resources they can’t easily afford, but which they need to find work: a decent internet connection, computers with licensed software, and private meeting spaces for video interviews and conference calls. Maybe they’ll just want a place where they can socialize with others in similar situations, an outlet to stimulate their imaginations, or a place to escape and access entertaining content. After all, today’s libraries not only nurture the mind, but the soul. To meet the needs of this vulnerable population, public libraries will need more staff equipped with strong technical, pedagogical, and community organizing skills. What if adult patrons could identify the types of projects they wished to work on and libraries in turn provided them with the resources to allow it to happen? Could libraries help users gain valuable experience that prospective employers would appreciate—in computer programming, cross cultural communications, and virtual collaboration? If financial inequality persists, don’t be surprised if public libraries start further restricting the content patrons can access, treating certain types of reading as more appropriate than others. If that sounds far-fetched, consider that this is precisely what many public libraries already do … for teenagers. Instead of looking to build bookless libraries or yet more maker spaces filled with dusty, unused 3D printers, library leaders should seek the advice of teen services gurus for inspiration. For example, in 2015 the San Antonio Public Library inaugurated its highly successful Teen Library, a new 6,000-square foot space that is designed much more to inspire and aid its users than house books and other materials, with plenty of room for teens to hang out in groups and explore high-dollar technology they wouldn’t otherwise be able to access. At the same time, because so many of the underemployed will be seeking refuge in public libraries in between gigs, government may start deploying more of its other services through these facilities since it’s more efficient to centralize activities into as few administrative units as possible. In Aarhus, Denmark, for example, the public libraries double as “citizens’ services centers” where locals can register a change of address or apply for a pension. The same will be true here in the U.S. One day you might dispute your speeding tickets and apply for gun permits at your local public library. But perhaps the greatest test for public libraries in the 21st century will be providing these services while still appealing to the more fortunate members of the new economy. Apart from the quaintness of the experience, why would wealthy people voluntarily visit a public library—one that, if improperly managed and under-resourced, could devolve into a dystopian, Apple Store version of the DMV? If the attraction was access to books and other content—whether digital or physical—then surely emerging technologies will provide more attractive alternatives over time. Without incentive to use these public spaces for themselves, wealthier Americans could oppose using their tax dollars to support libraries, or they could continue to support such funding, but under conditions that would take out much of the pleasure that comes from using this venerable institution. Public libraries of the 21st century might end up looking a lot like the libraries of the late 19th and early 20th centuries. It may surprise readers to know that there was a time when public libraries debated whether it was appropriate to lend popular fiction to borrowers—imagine not being able to check out Harry Potter novels from your local neighborhood library! The idea that taxpayers would fund reading for pleasure was scandalous, and certainly not what Andrew Carnegie intended. He wanted libraries to focus solely on providing access to edifying materials that would transform the uneducated masses into a more productive workforce. When Carnegie famously called on his fellow rich folk to give away portions of their wealth to benefit humanity, he clarified that such assistance should only be directed to those who were willing to help themselves—using the upper crust’s narrow definition of self-sufficiency. If financial inequality persists, don’t be surprised if public libraries start further restricting the content patrons can access, treating certain types of reading as more appropriate than others. No doubt the future still holds a lot of promise for public libraries. In particular, advances in technology and the adoption of Smart City practices—using data to track how well the public sector is doing its job and inform policymakers—should improve service delivery and greatly enhance the convenience, and therefore the perceived value, of public libraries. Growing inequality has the power to tear apart our society. Hopefully, public libraries will remain a common ground—for education, employment, and enjoyment—during a time when the gap between the rich and the poor is larger than ever. Ignacio Albarracín holds a master’s degree from the Catholic University of America and currently serves as Digital Services Coordinator for San Antonio Public Library. He is a 2015 Library Journal Mover & Shaker interested in how politics, economics, and technology influence the direction of public libraries and local government. He is also a devoted fan of FC Barcelona. Primary Editor: Callie Enlow. Secondary Editor: Eryn Brown.